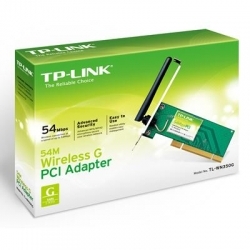 The TL-WN350G 54Mbps Wireless Network Mini PCI Adapter are fully compatible with IEEE 802.11b and IEEE 802.11g standard. The auto-sensing capability allows high packet transfer rates of up to 54Mbps for maximum throughput, or dynamic range shifting to lower speeds due to distance or operating limitations in an environment with a lot of electromagnetic interference. The Wireless Adapter can also interoperate with all the 11Mbps wireless (802.11b) products. Your wireless communications are protected by WPA/WPA2 encryption for high security.